The Enlightened Equipment Revelation is a custom-made down quilt from the great state of Minnesota. Now, I know what a lot of you are saying. "A quilt?" That's right. A quilt. Don't worry. I had the exact same reaction the first time I heard of a quilt as an alternative to your standard mummy-style sleeping bag for backpacking. Keep in mind that this ain't your dear old granny's quilt. The idea behind a quilt is that if you are using a sleeping pad as part of your sleep system, the insulation that would be beneath you in a traditional sleeping bag serves no purpose as it is compressed and loses a great deal of its ability to keep heat in. 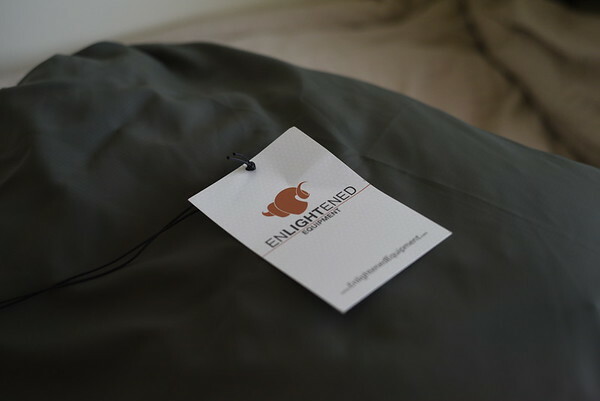 It is the sleeping pad which keeps you insulated from the ground, and the quilt tucks in beneath you and the pad, or beneath the pad and the ground, to complete the sleep system. The main benefit of the quilt is that you save weight by getting rid of the excess insulation and material that would normally be compressed underneath you in a traditional sleeping bag. Now, there can be a bit of a learning curve when using a quilt for the first time. Quilts usually have some straps or another means of attaching and securing the quilt to your sleeping pad. If you do not use these straps properly, you can end up with some nasty drafts. On the other hand, these drafts can come in handy on warmer nights, allowing you to more easily ventilate in comparison to a traditional bag. Furthermore, the Revelation is unique in that you can completely unzip the foot box and use it as a blanket with enough room for two. I recently brought the Revelation on a February backpacking trip down to Havasu Falls. 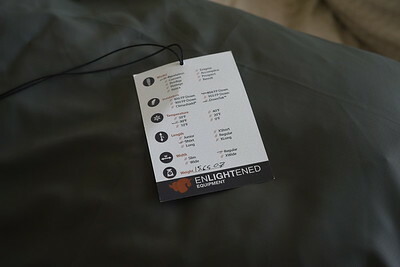 Being only 5'6", I opted for a short quilt from Enlightened Equipment. This saved me 1-2 ounces for you gram counters out there. I was a little worried the short might be too short, but I think it will work fine. If I could re-order, I think I would go with a regular length, though. The short would be perfect for someone up to 5'4" I think. At 5'5" to 5'6" you're pushing it a bit. I also went with a 30 degree quilt with 850 fill power down. This thing is super light! I believe it weighs in just over 15 ounces. Now, temperatures down in Havasu this time of year were dipping down in the low 30's at night. I must say, this quilt definitely kept me warm enough...when the drafts weren't bothering me. I move around a lot when sleeping, alternating from my side to my back. When on my back, the drafts were easy to keep closed. However, when switching to my side, I could feel the cold air creeping in along my back. Keep in mind, this was my first time ever using a quilt. I now know that I was not using the attachment straps in the most optimal way. Frustrated, I started experimenting with the straps when I got back home, and I believe I now have a draft-proof attachment method. I'm looking forward to giving this quilt another run in a few weeks. It's also important to remember that these quilts do not have a hood. Make sure you bring a knit hat, hoodie or hooded jacket along if temps are going to dip down at night. 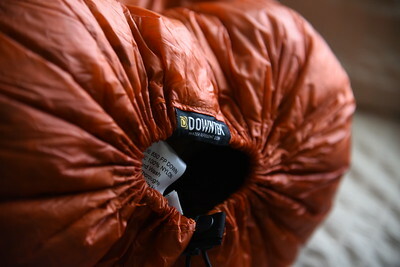 There are a number of makers of insulated hoods out there that pair well with quilts. Enlightened Equipment makes one called the Hoodlum (which I just purchased). I'll drop a short review on that item when I get a chance to take it out. 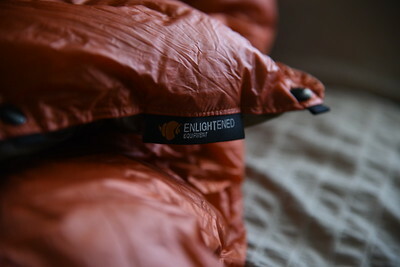 As I mentioned, Enlightened Equipment's products are customizable and made to order. With their quilts, you can select from 800, 850, 900 and 950 fill power untreated down or DownTek water repellent down. You can select your temperature rating from 0 degrees up to 50 degrees. You can also select various lengths, widths and colors of course. Keep in mind, these options can add significant cost to your order. Also, as with any made to order product, there will be some wait time. I ordered a quilt just before Thanksgiving and received it a few days before Christmas. My Revelation cost me less than $250 shipped with a 10% off Thanksgiving Sale coupon. It came with a stuff sack and a nice storage sack to keep it in between uses so that the down isn't constantly being compressed 24/7. Although I am still waiting to retest the Revelation after learning how to properly use the attachment straps, I am still prepared to give the quilt an 8.5 out of 10. If my next experience proves to be draft free, I will revise my rating to a 9 out of 10. 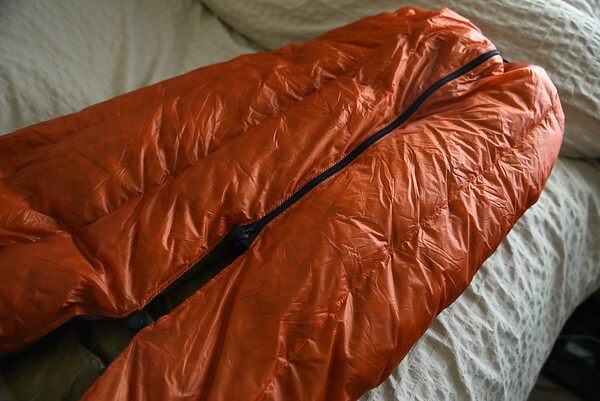 There just aren't many 30 degree sleeping bags and quilts out there for under $250 that weigh less than a pound and come with this many customization options. Disclosure: The reviews on this site may contain affiliate links designed to provide a means to earn advertising fees. If you click one of these links, I may receive compensation from the companies whose products I review. The opinions expressed here are my own.